There are a few considerations you need to make in order to help you pick the right wood flooring for your home. The wood flooring that you choose for your home might seem like a minor decision, but it has a major impact on the aesthetics and value of your home. Here are some of the many questions that you should keep in mind when choosing the perfect wood flooring for your home. Where Are You Installing Wood Flooring? This is one of the most important questions that you will need to answer when choosing wood flooring for your home. Solid wood flooring can’t be installed in areas of your home that are below-grade (or below ground level), since it can’t maintain integrity with the increased humidity and moisture below ground. Engineered wood flooring can be installed in the basement of your home without suffering any damage. Keep in mind that the area of your home you will be installing wood flooring has a direct impact on what exactly you can install. What Subflooring Do You Have? Do you have concrete subflooring only? Engineered wood flooring will be your best option, since the only appropriate installation methods for concrete subflooring are floating or gluing the boards down. Solid wood flooring cannot be glued to the ground, thanks to humidity, so keep this in mind when determining what type of flooring to choose. Do you have a plywood subfloor? You can choose from either traditional solid wood flooring or engineered wood flooring. If you aren’t totally sure what type of subfloor your home has, don’t be afraid to ask the flooring experts at Jason Brown Wood Floors. Once you know whether or not you can install solid wood flooring or engineered wood flooring, consider how you will actually be using the area of your home. Does this area get a lot of foot traffic? Do you have many guests over frequently? Who uses the area of your home (children, pets, adults, etc.)? Is your home more formal or more cozy and comfortable? 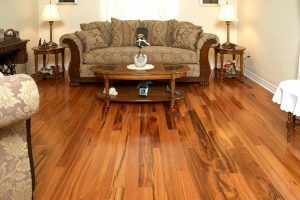 The answers to all of these questions will help guide you towards the perfect wood flooring for your home. This entry was posted on Friday, July 7th, 2017 at 10:12 am. Both comments and pings are currently closed.